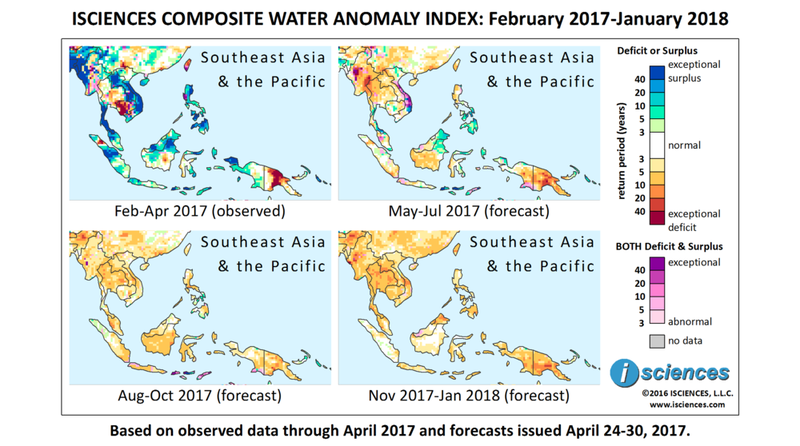 The 12-month forecast through January 2018 (below) indicates water deficits in eastern Myanmar, Thailand, Borneo, and Papua New Guinea. Deficits may be extreme to exceptional in northwestern Thailand into Myanmar, and in Papua New Guinea. Extreme to exceptional surpluses are forecast for Sumbawa and Flores Islands in Indonesia. Myanmar's Rural Development Director from the Ministry of Agriculture, Livestock and Irrigation estimates that 500 villages in the country may experience water shortages from lack of adequate rainfall. The government's water emergency supply program has already distributed 6.65 million gallons of water to 222 villages for 260,000 people, and has earmarked K81.5 million (Myanmar Kyat; ~USD$60,000) in fuel costs for drought-stricken townships. Villages in the States of Kayah, Rakhine, and Shan, and Mandalay Region have reported shortages of drinking water. Wells and reservoirs have dried up in 20 villages in Shan State where a youth group, police unit, and other civic organizations have donated water. In Rakhine State lakes are drying up, soldiers are delivering water, and dengue fever and diarrhea have broken out. Across the border in Mae Hong Son Province, Thailand has also deployed soldiers to supply water to hospitals and communities. Farther south in Utai Thani Province the drought has forced farmers to take on supplemental jobs for income. Severe drought has struck Central Java, Indonesia in recent weeks, affecting 15,000 residents. The Disaster Mitigation Agency is preparing delivery of 70 6,000-liter water tanks to Paranggupito district in Wonogiri Regency where wells and ponds - the primary sources of water - are going dry. A new report compiled by an international research team indicates that the area of wildfires in Borneo during drought years is ten times larger than during non-drought years, increasing fire risk. As blues and greens in the first map give way to yellows and oranges in the remaining three, the progression from observed surpluses to a forecast of deficits is apparent. From May through July moderate to severe deficits are forecast to emerge in eastern Myanmar and western Thailand. Exceptional deficits in Papua New Guinea will downgrade but severe to extreme deficits will persist and emerge farther west into Papua, Indonesia. Moderate deficits are forecast to emerge in the western two-thirds of Indonesian Borneo. Surpluses reaching exceptional severity are expected to persist in Sumbawa and Flores Islands, Indonesia. Moderate surpluses are forecast for northeastern Borneo and southern Philippines. From August through October deficits in the region will downgrade and surpluses will nearly disappear. 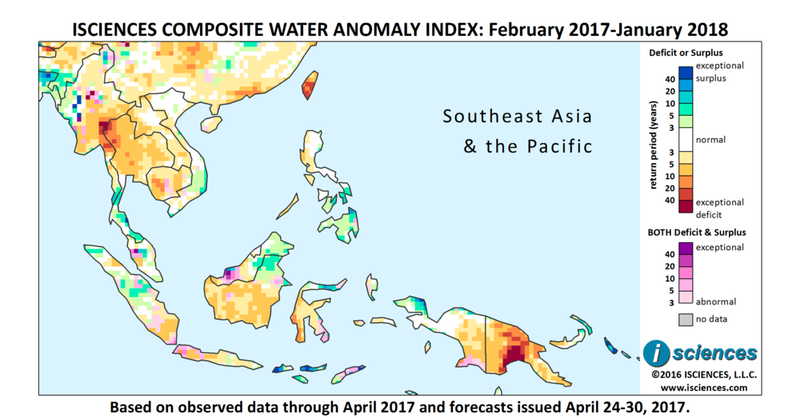 Moderate deficits will continue to emerge across mainland Thailand, Indonesian Borneo, and southern Sumatra, and will emerge in central Java, Sulawesi, and north of Kuala Lumpur, Malaysia. Scattered deficits will persist in Papua New Guinea but are forecast to be less severe than in prior months. The forecast for the latter three months – November through January – indicates that the extent and severity of deficits will increase in Southeast Asia and Papua.